What is the investment opportunity from America's financial crisis? Somewhere north of one trillion dollars of debt--mortgages, credit cards, and other forms--will be written off and sold to buyers at pennies on the dollar. It gets even better: There are ways to buy that debt with no money of your own. Society's collective pain from this crisis means that it's unlikely to occur ever again on this scale. Investors with the right roadmap are poised to profit spectacularly. Bartmann lays out a step by step plan on how to find the best deals from the federal government, local Financial Institutions, and loan brokers. The spectrum of loans that are available include: credit card debt, consumer loans, business loans, commercial loans, and real estate loans. You’ve heard about the massive government bailout of the financial sector and its cost to taxpayers. Couple that with skyrocketing unemployment and a shrinking stock market and you might think this is a terrible time to invest in anything. But you’d be wrong. 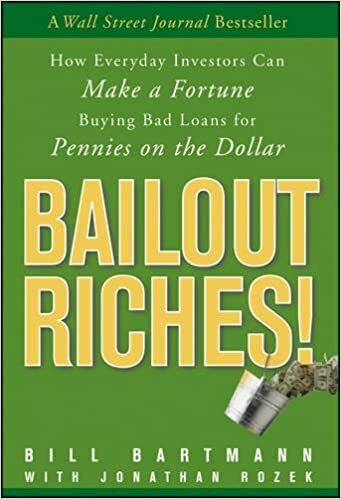 In Bailout Riches!, Bill Bartmann shows you how to invest in the bailout itself and take your own cut of the trillion-dollar pie. What does Bartmann know about bailouts? Only that the last big-time government bailout-involving the savings and loan crisis and the government’s Resolution Trust Corporation- made him a billionaire. This time around, the bailout is much bigger and opportunities for profit are much greater.